Producer: Edward L. Alperson Jr. 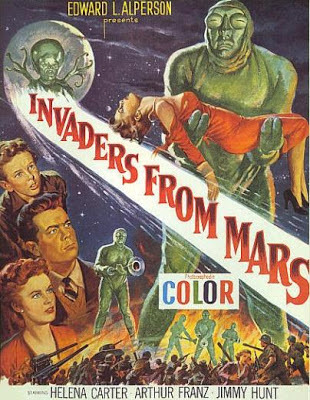 The story of Invaders from Mars is told from the point of view of a boy, young astronomy buff, David MacLean who is awakened at 4.40am by a thunderstorm and is stunned to witnesses from his bedroom window a large flying saucer descend and disappear into a sand pit not far from his parents’ home. Just prior to this incident, David’s parents are awakened by his alarm clock going off at 4.00am because David wishes to be up to view a particular nebula. Interestingly enough, David’s mother, Mary says to her husband, “you’ve been dreaming” when he decides to get up and check on his son. Is the viewer being set up for something here? George goes to investigate David's claim the next morning and mysteriously disappears. While George is missing, David's mother, Mary calls the police. The two policemen who arrive begin to investigate and are soon swallowed up by the sand in the backyard. When George and the policemen return much later in the morning, he seems to have acquired a red puncture mark on the back of his neck and he is behaving in an oddly cold and uncharacteristically hostile manner. Note the close-up on George’s face. We immediately know something is wrong just by his expression, coupled with his savage tone of voice and his abrupt and rude manner. When he strikes his son, it is like a bolt out of the blue and we almost feel it as much as David does. David quickly realizes that something is very wrong and eventually goes to the police station for help after he notices that other townsfolk are acting in the same way and after witnessing his young neighbour Kathy Wilson walking in the sandpit near where the saucer landed and disappearing underground. In addition to the help from Dr. Blake, David receives assistance from local astronomer, Dr. Stuart Kelston. It is conjectured that the flying saucer is probably the beginning of an imminent invasion from the planet Mars which is now in close orbital proximity to Earth. At the moment, “Mars is closest to us in its particular orbit.” Kelston goes on to state that the Martians make use of “mu-tants” to sustain their way of life in space and that they are taking action now due to a perceived threat from rockets being shot into space from Earth. It turns out that David’s father is working at a plant that produces the motor assembly for an atomic powered rocket. 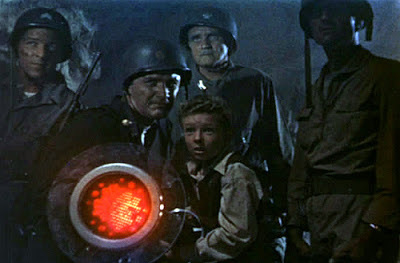 The army is eventually called in to investigate and troops and tanks under the command of Colonel Fielding are sent in. The invading Martians’ sabotage plot at an important nearby government rocket research plant is soon uncovered. The secondary “baddies” (the two police officers, General Mayberry and the police chief) who have had controlling devices implanted in their brains, are dispatched with lightning speed. The army organises its forces and surrounds the saucer landing site. 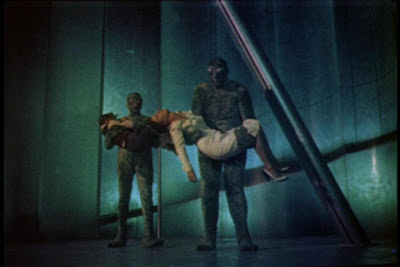 Meanwhile, Dr. Blake and David wind up underground and are captured by two tall green humanoids and are taken to the Martian and its flying saucer. Will the Martian sabotage plan eventually succeed, paving the way for an ultimate invasion of Earth? Will the army have the necessary clout to defeat the Martian menace of the mind-controlling alien Mastermind? Not long after the start of the film, Invaders From Mars, you might baulk at the idea of having a kid as the central character and wonder where the heck you are with one foot seemingly lodged in a more or less familiar on-screen world with the other foot being immersed in a more than usual bizarro-world of movie sci-fi consisting of illogical (“surreal” – sorry!) plots and characters. True, if you approach the film with a purely rational and adult mindset. But be careful where you do step because with this film you are not in control! 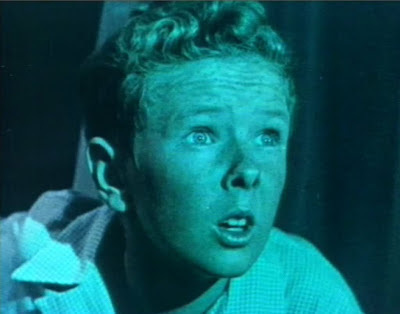 In Invaders From Mars, David's dream is in fact a nightmare or alternate reality reflecting the various pressures being faced by a young boy. It is filled with threatening doppelgangers of significant people he knows in real life. It is a world where, as in a dream, logic takes a back seat and people and events become representations of something else. We get to see and experience things from David's point of view with only his world, his fears and his perceptions forming our frame of reference. For a young person such as David growing up, the world can be an insecure and threatening place with remote authority figures who cannot always be trusted, but who seem instead to be bent on controlling and circumscribing their lives. How to approach such people and make them take notice of what you say, how you feel and what you think?? A difficult task indeed when the adults in your world are worried about possible annihilation from atom bombs and foreign conspiracies destroying their way of life! Such fears are all too easily projected onto young people and it is easy to overlook the effect this has on them. David’s dream world reflects a large part of his real world experience. 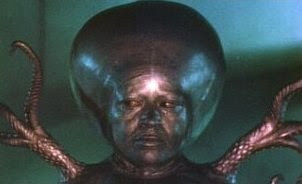 He lives a largely protected and sheltered life and it is his youth and limited experiences which have caused him to construct such a loopy scenario as expressed by the character, Dr. Stuart Kelston whereby the Martians have come to the Earth in Motherships, that they live underground on Mars and have bred a race of synthetic humans called Mutants as their slaves! In David’s world, events are reduced to shades of comic book black and white with no subtle shades of grey. Even the characters of his dream world are identified stereotypically by the colours they wear: His mother dressed in black and Pat dressed in white. David lacks credibility and power by virtue of his age and nobody is going to take his predicament seriously. His parents have become distant and unfeeling monsters who have become part of an alien conspiracy to conquer the Earth. His parents appear like evil villains straight out of comic books or TV serials with their conspiratorial whispered asides. So, who will listen to him? He is just a kid. However, this is David’s dream and by virtue of this fact he does have some measure of power. After all, in his world adults can be made to look ridiculous such as Colonels and scientists finding themselves looking silly being perched up on a roof, a place that David would be forbidden to go by those very same adults! Take that! There are adults in this dream world that David can call on for help. Take Dr. Pat Blake, from the city Health Department. 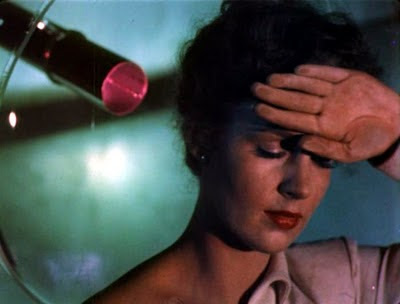 Where did they find all these stunningly beautiful women for these 1950s Sci-fi films? David’s subconscious has come up with someone who is tender like a mother who takes him seriously, accepts him and stands by him. She can even lie for him such as when she tells David’s parents that he has “every symptom of polio” in order to keep him out of their clutches. (Just like David has probably told his parents a few white lies in order to avoid getting into trouble) For his part, David’s young mind has transformed Pat, who he probably has a crush on, into a kind of screen heroine. It is extremely difficult for the viewer to take their eyes off Pat, particularly with the red adornment placed above her left breast which stands out starkly from the white background of her ‘uniform.’ It is with no surprise that we discover Pat lying helplessly on a glass operating table, with one shoulder bared and with a pulsing penetrating device slowly moving toward the back of her neck ready to violate this older woman that young David is on some level attracted to and who he must rescue from the clutches of these alien “rivals.” Not much different to the heroine tied to the railway tracks with the train looming closer! Kelston can hold and comfort Pat though since he has become an ideal representation of a future and older David. Go back to the shot of David and Kelston side-by-side at the telescope! David’s dream logic gives him the power to act and be the hero for the world and his heroine, such as his inexplicable ability to leap into action, take charge, identify and operate the Infrared tunnelling Raygun, despite the fact no one has seen or used one before! What an action hero! In David’s dream world, there are also other heroes he can draw on for support such as U.S. Troops: Men who represent and personify the American ideal of decency and exist only to protect and serve. So, by what means are we being invited into this distorted dream-like representation of David’s reality? 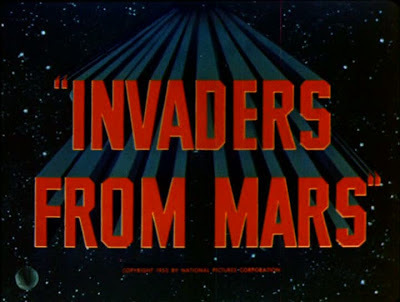 Invaders from Mars makes effective use of low and high camera angles to emphasize the dramatic and visual impact of key scenes. For instance, in the police station, the long entrance way combined with high and low camera angles emphasize David’s smallness in the face of officialdom and authority. The Hill seems to be a stylized dream image, giving it the quality of an alternate world that one enters at one’s own peril. 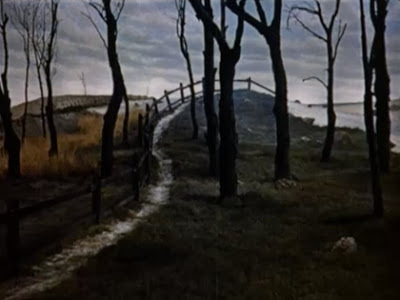 It is a living sinister place where characters are led up a curved path that winds up the hill between leafless black tree trunks and a broad blackened plank fence. At the top of the hill the fence dips out of sight where characters are then fed into the sinking sand of the Pit and downward into the bowels of the hill. The hill set deceives us with an optical illusion despite its flat painted picture-like perspective design. Notice, however, that when a character walks up the path, they seem to diminish in size. The optical illusion makes it seem as if they are shrinking as they walk and reach the top of the hill. The use of glass paintings helps to create similar illusions such as the view being given down the glass tube above the Martian operating table. The police station set design consists of strangely elongated features and stark, unadorned walls, making it appear like a dreamlike surrealist painting. It is as strange and unreal as the lab that Kathy’s father works in. Once again we have high ceilings and long entranceways leading directly to an oversized focal point, in this case extremely tall test tubes. Both places are pretty much David’s own personal constructs gleaned from movies and comics. So, it is no surprise that we find Kathy’s father busy at work in the lab just after his daughter has died! All part of David’s youthful lack of life experiences. Lines and angles on the sets are frequently used to draw our notice to particular people and objects. Take the blackened plank fence on the hill. As foolhardy Sergeant Rinaldi advances up the hill toward the pit, the fence line serves to both frame his body and trace his direction of movement up the hill and down into the pit itself. Notice how in the spaceship, lines in the form of support pylons set at an angle lead our eyes directly to the soldiers placing explosives on the floor or Pat lying on the floor where she was initially placed. 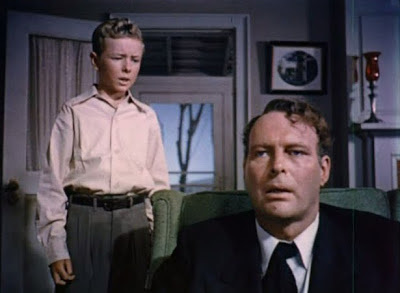 Clocks: Time and its importance is emphasized in Invaders from Mars as it either seems to be running out or as in a dream it has elasticity as it not only advances implacably forward toward ultimate disaster, but also seems to almost stop and move backward. There are images of time-pieces that are focussed on in the film, from the clock in David’s bedroom to the lone clock on the police station wall. Footage from WW2 training films to show lots of hardware and tanks supposedly taking up position around the Pit. Repeated sock footage, sequences, camera angles and camera shots. One result of this kind of repetition is that we are supposed to believe that there are numerous “mu-tant” Martian slaves and can-do GI Joe soldiers battling it out in the Martian tunnel. The bubbling, melting walls of the underground tunnels caused by the Martian heat-ray was an effect created by shooting a large tub of boiling oatmeal from above. This breakfast cuisine was colored red using food coloring and lit with red lighting. Apparently more than 3,000 latex condoms were inflated and stuck on to portions of the tunnel set's walls to create the cooled, bubbled-up effect on these blasted out sections of the tunnel walls. Can you imagine the fits of laughter while completing such a project and being lubricated with a few beers! So who’da thunked it? Condoms are not just great water balloons! The eerie vocal effect of the chorus seems to be almost in stark contrast to our notions of the 'heavenly chorus' of angels. It feels disturbingly discordant to our ears and adds to the “surreal” quality of David’s dream world. We know instinctively that nothing good is being indicated by it. A large explosion together with lightning and a clap of thunder, rips both David and the viewer back to what seems to be reality. David runs from his bed into his parents’ bedroom where they reassure him he was just having a bad dream. David returns to bed, but with the noise of more wind and loud thunder he climbs out of bed again and goes to his window. And what does he see? The flying saucer of his dream slowly descending into the sandpit! With the image of David’s face dissolving to the "The End" title card, we are left wondering: Is young David still asleep, trapped in some kind of recurring loop of a nightmare? Or perhaps his dream is a premonition of things to come? Or maybe it was all just a dream?